On 25th August I wrote about working freelance from home. 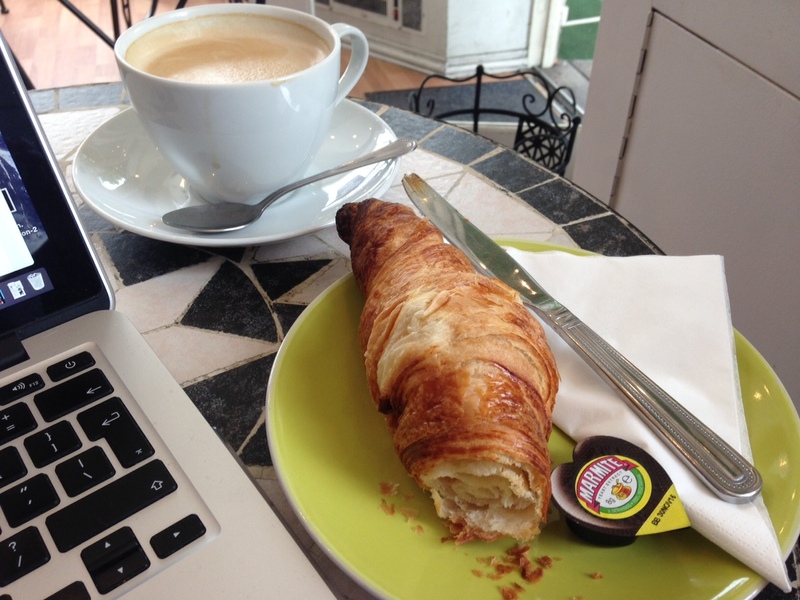 I confessed that sometimes I need to ‘run’ to a coffee shop to work where there are no distractions… I’m sitting at my local right now enjoying a latte and a croissant. A coffee shop is the rare occasion where I choose coffee over tea. I love my local cafe. It’s just 4 blocks from my flat, run by a motley group of Middle Eastern ladies with friendly smiles and free wifi. They are useless at almost anything edible except lattes and croissants – but the people watching is worth it. All types, from dusty builders and mums with baby (with another on the way), to suited executives and elderly citizens come and go while I work. I come from a long line of people watchers. A fascination for stories and people was birthed in me. Back to the present and my seat at the cafe. One patron really fascinates me – grey-haired, alone, quiet and frequently stifling a cheeky wry smile as if enjoying his own private joke. I come here rarely and he’s always here, sitting at the same table opposite me, always with a book and a pen in hand, voraciously writing. Is he a writer I wonder? Is he studying? Reviewing the book? Adapting a screenplay? Preparing to teach a literature course? Can you break the people-watcing spell if you ask the questions that are churning around in your head? Dear readers, should I stop watching and introduce myself to him, ask him what he does? Or should I just keep imagining? Mmmm … the dilemma!! Out of curiosity you want to ask but in asking you break the fascination that he holds right now!!! What did you do????? Exactly! He left and I kept quiet. I’d keep imagining. The reality of a retired accountant giggling about the fiscus might make you weep!